Chamilia presents these beautiful stud earrings inspired by Belle from Disney's classic tale Beauty and the Beast. 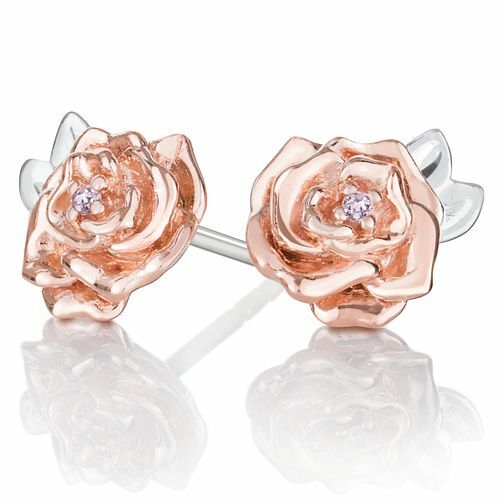 Crafted from shining sterling silver and luxurious 9 carat rose gold, these gorgeous stud earrings feature an intricately detailed rose, perfect for any Disney fan. Discover all the ways to express yourself with Chamilia. Chamilia jewellery is as unique as you are! Chamilia Disney Beauty & the Beast Belle Rose Earrings is rated 5.0 out of 5 by 5. Rated 5 out of 5 by Anonymous from Nice and Cute Bought these for my girlfriend as part of her birthday present. She absolutely loves them and they look good on - definitely look better on than they appear in the pictures on the website. Rated 5 out of 5 by Anonymous from Lovely Earings Earring presented well in a cute little box. Earings themselves are beautifully made and look stunning. Brought these as a gift to my mum and I just know she will love them. Fantastic Earings really pleased, from The beauty and the Beast range.